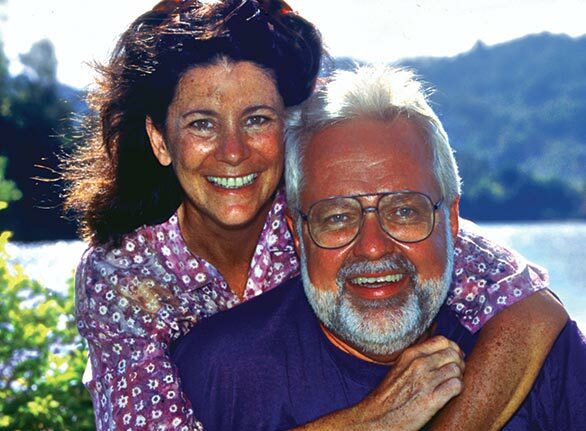 Denise Nielsen Tackett with her co-author and life partner Larry D. Tackett, circa 2000. A resident of Paden City, West Virginia, Denise had traveled the tropics of the world for many years, primarily in the Indo-Pacific, photographing the beauty and biodiversity of coral reefs. She and Larry also spent 13 years collecting sponges and other organisms in a search for disease-treating natural compounds being sought by the Cancer Research Institute of Arizona State University. During these years, both Denise and Larry honed their skills as underwater photographers, eventually amassing a world-class collection of images of fishes and invertebrate life. A collection of their photographs and observations of tropical environments appeared in REEF LIFE: Natural History and Behaviors of Marine Fishes and Invertebrates (Microcosm/TFH Professional Series, 2002). With her husband Larry, she annually created an acclaimed Reef Life Calendar with portraits of reef fishes, corals, and other denizens of the tropical shallows. She is credited with discovering one of the world’s smallest seahorses, named Hippocampus denise in her honor. “Denise was a woman of incredible character and strength,” said Editor & Publisher James M. Lawrence. “For some 15 years, I had the joy of working with her brilliant images and knowing that her work ethic in researching her subjects was second to none. Among the world’s top ichthyologists she had a reputation for spotting things others missed and for doggedly working to get her species identifications and her scientific facts correct before presenting them to the public. Denise is survived by her husband, Larry D. Tackett, Campus Dean, West Virginia Northern Community College. A full tribute to Denise Nielsen Tackett will appear in the May/June Issue of CORAL. Thank you for this tribute to Denise Tackett. Denise was our neighbor and we have the greatest respect for her. It was fun watching her work in her Flower Garden that she created in her front yard. I would see her up on her carport, painting the roof. She would haul mulch, dig up concrete, build more garden area, and created a beautiful garden pond in the back yard with many fish, some of which she shared with me for my pond. I still have them. Denise was a private person, but with a sincere love of nature and science in general. I am so fortunate to have known her, and I call her a fine neighbor in our little town of Paden City. I respected Denise and was slightly intimidated by her wealth of expertise in nature and research. I felt there was nothing she couldn’t accomplish. One of our friends visiting with us one day, observed her breaking up concrete and loading soil into her garden area, and remarked, ‘Where do you find a woman like that?” Well, I don’t think there is another like her.